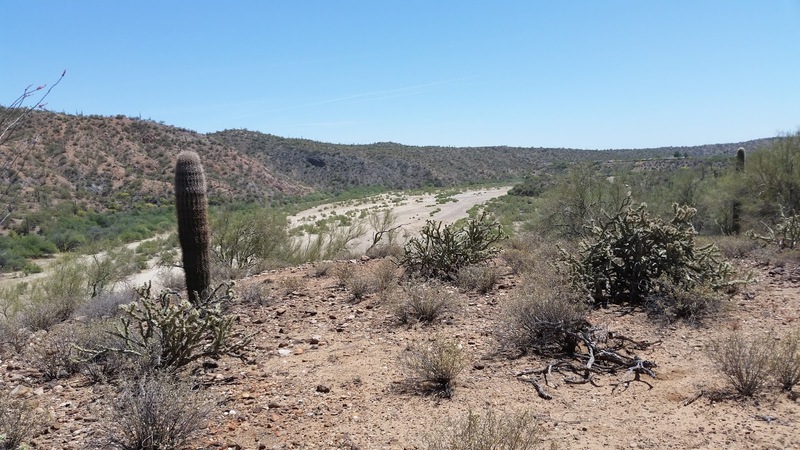 Five miles northeast of the small town of Wickenburg, AZ is some BLM managed land along a dried up river that's called Sophie Flats. I camped there for a week in late April amid perfect temperatures, low-80's during the day with constant breezes and high-50's at night for ideal sleeping conditions. Sophie Burden was a co-owner of a historic Remuda Guest Ranch and the Flats are named for her. The dried up Hassayampa River running through Sophie Flats. The Wickenburg Conservation Committee maintains several miles of hiking and horseback riding trails through the Flats although all I saw during my time there were ATV's whose riders seemed to prefer the sandy river bottom to the trails. 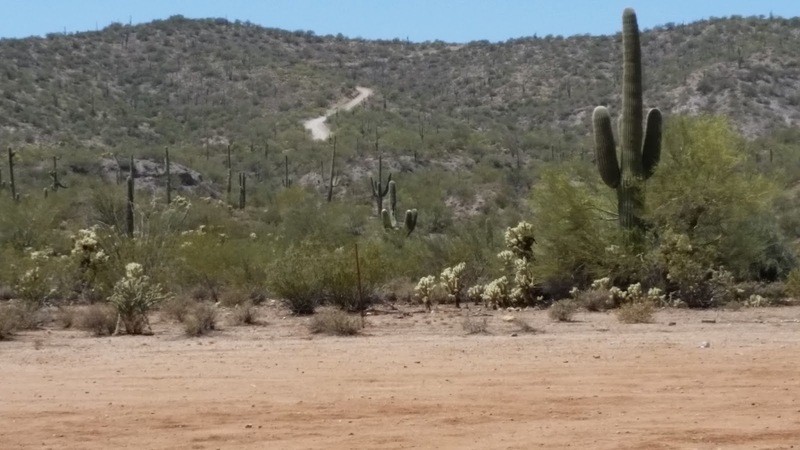 I actually wound up staying at Sophie Flats because a road I was following suddenly became way too steep for the Tank and I had to carefully turn around and head back down to the Flats. The road up that hill became way too steep for the Tank so I turned around. 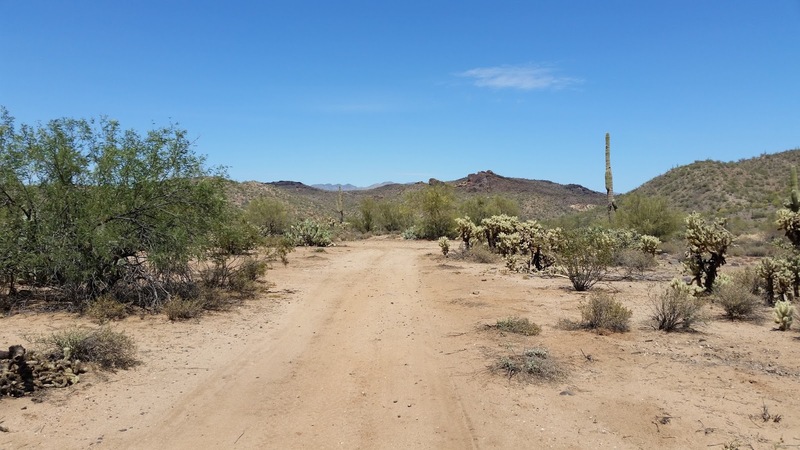 The topography of Sophie Flats is a good representation of Arizona's desert, billions of stones and bigger rocks and lots of cactus. 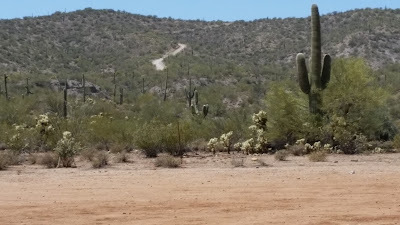 The road thru cactus to Sophie Flats. 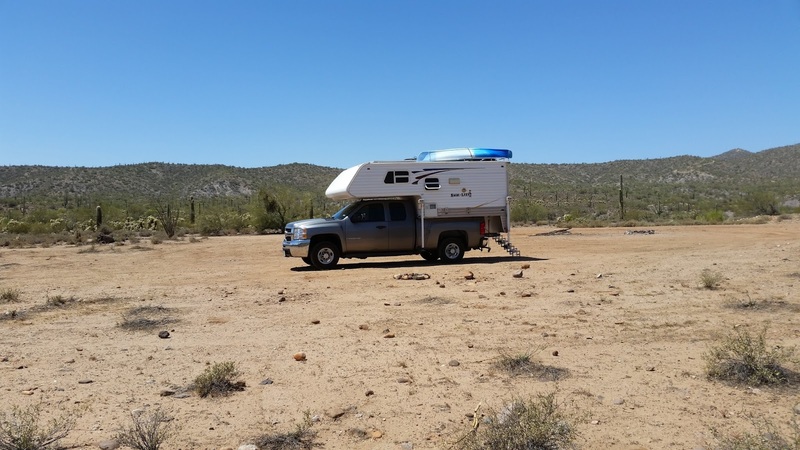 There are several small roads off the main road to Sophie Flats that when followed take you to campsites where fire rings have been constructed out of the abundant desert stones. The Tank's campsite with requisite fire ring. Some people I've talked with don't care for desert camping but I enjoy it. Sophie Flats gets pretty noisy with all the ATV traffic on the weekend but during the weekdays it was surprisingly restful. And of course you can't beat the price, right?